Dean Cornwell began his career as an illustrator in 1914 and worked steadily at his avocation until his death at sixty-eight. His art appeared regularly in popular magazines and important books written by a number of the most outstanding authors, including Pearl S. Buck, Lloyd Douglas, Edna Ferber, Ernest Hemingway, W. Somerset Maugham, and Owen Wister. This left-handed illustrator painted more than twenty murals for various public institutions and in the process became one of the nation’s most popular muralists. Cornwell was born on March 5, 1892 in Louisville, Kentucky and his father, Charles L. Cornwell, a civil engineer, largely influenced the young boy’s interest in drawing due to his drafting of industrial subjects for hours on end. Because of his father’s engineering career, there were always sketches of bridges and railroads found around the Cornwell house and they intrigued young Dean who found it incredulous that they could be drawn so exactly. A similar influence on his career was the nearby Louisville and Portland Canal constructed during the Industrial Revolution. As a result of its magnetic attraction for the young boy, one of Cornwell’s earliest drawings at 13, is entitled ‘Tell City’, a sketch of a steamboat passing through the Louisville and Portland Canal. Like so many other illustrators of note, Dean attended the Art Students League in New York. He was there in 1915 and met Charles Chapman and studied under Harvey Dunn, a leading disciple of Howard Pyle. Harvey Dunn proved to be a great influence on Cornwell in respect to color theory and composition. Dean was also lucky to study under the notable Frank Brangwyn, an English muralist of worldwide fame. Dean Cornwell’s work reveals a combination of dynamic colors with a formal composition of the elements he wished to capture within a limited space. He was known to create countless studies on paper before finally committing an image to canvas. This on-going refining process was an approach which created magnificent results, and his works were promptly accepted by art directors and publishers for the finest magazines including; Harper’s Bazaar, Cosmopolitan, Redbook, Good Housekeeping, and The American Magazine. In his painting, ‘Desert Healer’, Cornwell’s composition invokes both the gravity of the situation and painting structure, giving the viewer a tactile sense of the atmosphere created. The vast space of the sky above represents infinity counter-balanced with the sand on earth below, while the hero of E.M. Hull’s story lies across the canvas and delicately divides the two, as the central focus-a powerful statement. By the 1930’s and 1940’s, Dean Cornwell became known as the ‘Dean of Illustrators,’ with his patriotic images and war posters everywhere, as were his advertisements for blue chip companies like Seagrams, Palmolive Soap, Scripps-Howard newspapers, Coca-Cola, and General Motors. Cornwell painted a series of advertisements for Wyeth Laboratories, which commemorated important occasions in the history of medicine, such as ‘Conquerors of Yellow Fever’. The Wyeth commission advertisements became collectibles if one could be found that was not badly faded for having been on display in a drugstore window. 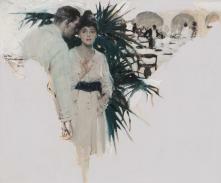 Paintings by Cornwell have been exhibited in the Whitney Museum of American Art, the Pennsylvania Academy of the Fine Arts, the Chicago Art Institute and the National Academy of Design. He taught and lectured at the Art Students League in New York City and at museums and art societies throughout the United States. James Montgomery Flagg paid him a tribute when he said, “Cornwell is the illustrator par excellence-his work is approached by few and overtopped by none...he is a born artist.